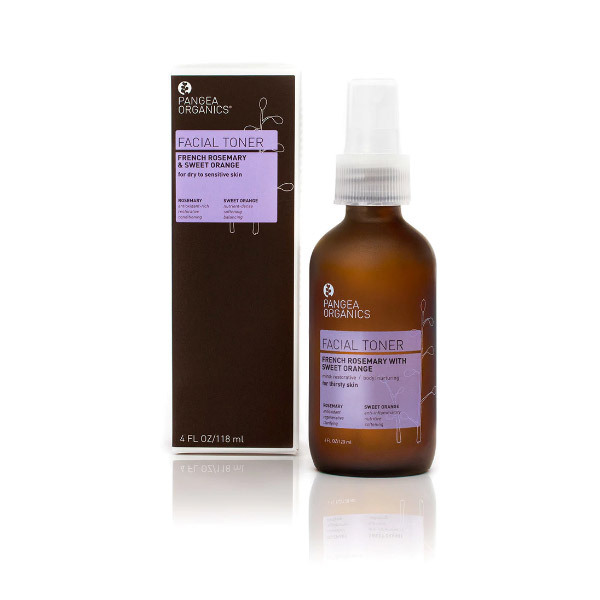 This Facial Toner delivers targeted herbal extracts that are ideal for dry to sensitive skin types. Especially good for dry-to-sensitive skin, this award-winning formula contains a star-studded lineup of harmonizing, anti-inflammatory botanicals, including Marshmallow, which is renowned for its success in treating rosacea, eczema and dry, flaking complexions. It’s a well-kept secret that toner is the mightiest anti-aging weapon since downward facing dog. Pangea’s formula works with your skin to create the perfect pH — something that, if out of balance, leads to crow’s feet, sun damage and a tired appearance. When applied after cleansing and before moisturizing, this little bottle of wonder increases your skin’s ability to receive nourishment while simultaneously shrinking the appearance of pores. We recommend keeping a bottle with you at all times as a quick way to refresh, nurture and relax while also eliminating harmful impurities. Getting toned was never so easy. Toner completes the cleansing process by removing all traces of dirt and oil, refining pores, bringing the skin to balance and preparing it to thoroughly receive the benefits of our Facial Cream. Take your skin care regimen to the next level with this nurturing facial mist for use after cleansing and before moisturizing. Also ideal for use throughout the day to refresh, remove impurities and awaken your senses. French Rosemary & Sweet Orange Facial Toner delivers targeted herbal extracts that are ideal for dry to sensitive skin types. Following Facial Cleanser; close your eyes and mouth, mist face, neck and décolleté 3-6 times. Breathe deeply to enjoy the aromatherapeutic benefits. Best if used morning and night. For optimal results, follow with Italian Red Mandarin with Rose Facial Cream. Have you ever looked at the ingredients of your facial toner and asked yourself 'why so many ingredients' - and why does 'alcohol', meant to be a natural distillate, have numbers and letters attached to it? Finally, a toner with simplicity & transparency right on its label, infused with aromatic ingredients that enhance its application by individual skin type - focused to (non inclusive) tightening pores, balancing sebum production (oiliness), hydration/softening, infection (spots and breakouts), inflammation, exfoliation, anti-wrinkle (anti-oxidant) & pigmentation + creating an emotional (mental) response that is replenishing, calming, balancing & uplifting. Created to enhance cleansing the face this product is also wonderful as an all over body spritz - apply before your lotion - or as a rejuvenating mist throughout the day (close eyes and mist 4-6 inches from face/body). Applied in this manner choose your toner for the 'emotional' response you are seeking to balance or achieve.